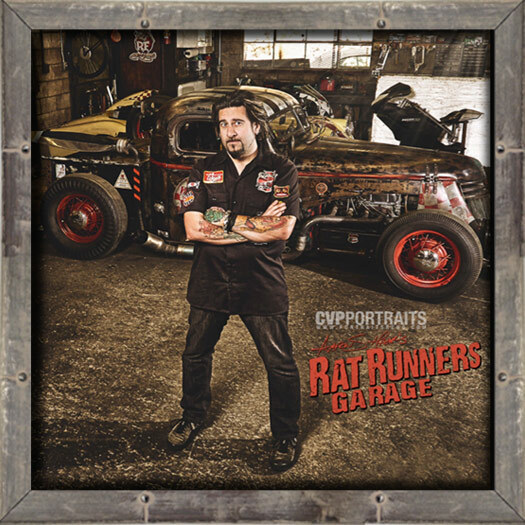 Aaron S. Hagar’s RAT RUNNERS GARAGE is about the “Art of Resurrecting and Preserving Old Metal”. It is an art based Hot Rod and Custom shop that creates outrageous and over the top Rat Rods and restorations as well as motorcycles, painting and original art. Specializing in old metal, Aaron and his crew, rip from the ground or drag from the fields old relics to be preserved and resurrected back to their former glory. With the idea surrounding “re-purposing” the RRG crew design, engineer and build rolling, functioning works of art! These full blown Hot Rods are built in the tradition of the shared and combined knowledge of a lifetime of building and crafting. Passing on the love and passion of traditional Hot Rodding mixed with the modern lifestyle of Kustom Kulture. Aaron Hagar has been an artist and craftsman all his life, and with his talented team RRG is continuing to break new ground, rediscover this tradition and inspire this passionate movement of current and future builders and preservationists.